So what do you do when it's hot as blazes outside and the house is a total wreck while the bathroom remodel is in progress? Well, apparently I dream about fall and do some early fall shopping. Y'all know I'm all about changing up my beds seasonally so I've been taking advantage of some fabulous sales. I'm not actually changing up the rooms for fall yet. No, it's still too early for that. I'm just in the planning stage. This duvet cover will be in my master. I always love how they make these messy beds look good. I've tried that and failed. I can use my textured brown euro shams with that duvet cover. The duvet is in beautiful muted colors of tans, olive, blush, soft blue, chocolate and more. The pillow combinations I can use are endless and y'all know I have a stash of them. 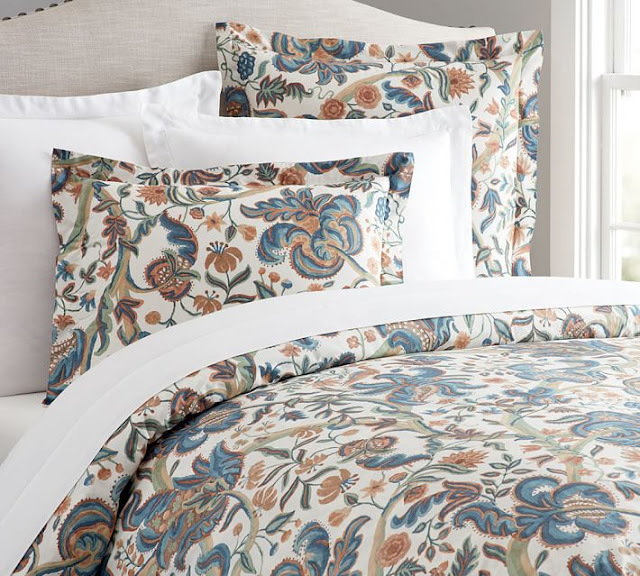 I could use these quilted linen shams and even this blue sham will go with the blue in the duvet. I may use these natural colored shams. 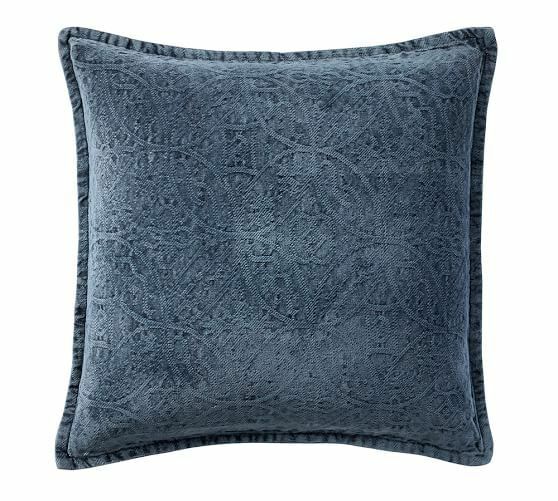 But my, oh my, when I went to my local store.....just to look (yea, right) they had this beautiful textured pillow on display on a bed with the same duvet that I had already ordered. I just happened to be there when all the pillows were 20% off plus I had a coupon to use from shopping too much with them. So a couple of these just had to come home with me. This is so much prettier in person. ....or this one from my fall bedroom last year. I may use the other one first since it weighs less and then switch to this heavier one for winter. See, endless possibilities. 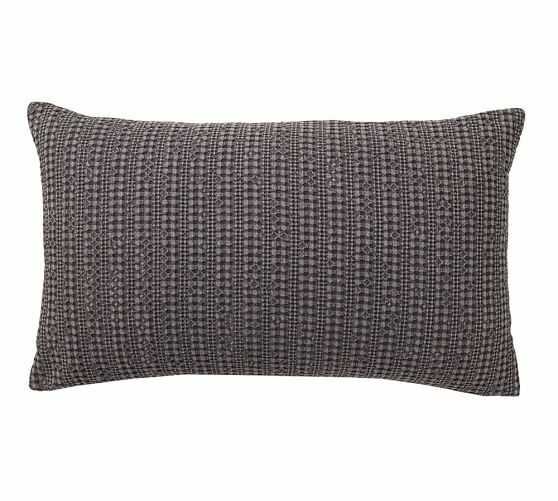 along with this textured pillow. Have y'all seen the new textured pillows at PB this year? They have some beauties and in gorgeous pinks, berries, plums, and chocolate. And this one for another room. Just the duvet. I like to mix and match using things I already have. I just love the colors in this for fall. 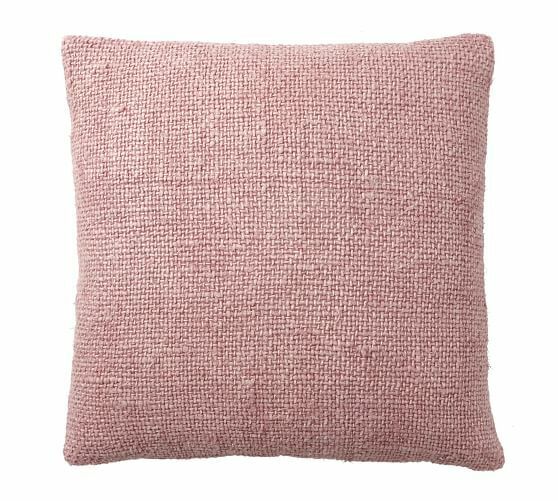 This chenille pillow is so pretty in person. The color is more subtle than this pic from PB. It kind of has a vintage look to it being faded in some spots. I got this one deeply discounted. I can use these in so many places. I'm looking forward to playing house again. all photos that are not mine are from potterybarn.com and this is not a sponsored post. I think you must be bored. . . I love summer and not wishing it away. I don't love how hot and humid it can get, and this year has been better than many. So many fun things to do! Thankful to be so close to lakes and the cool mountain streams. I can't stay shut up indoors! Not even thinking about fall here, we've got two more months that will at least feel like fall. Enjoying the slower pace and summer activities. Hope you all get the cooler temps this weekend too!! I'm guessing I missed the post where you are finally able to hit the stores in person, not having to totally depend on online shopping!! I'm sure that's a great feeling!! All pretty choices Kim. I am waiting until we move into our new home before doing and more shopping - well at least I am trying not to shop, lol. Those are all gorgeous. Great finds. Those quilted covers are called boutis in French. I love them. It's a gorgeous duvet. I just bought a new one for our master, a MacKenzie-Childs. It was on sale at Neimans and I took it home just to see. We decided we like the look for a change. We've had all white bedding for years. This is a fun change. Enjoy the process. I wish we were remodeling a bath. 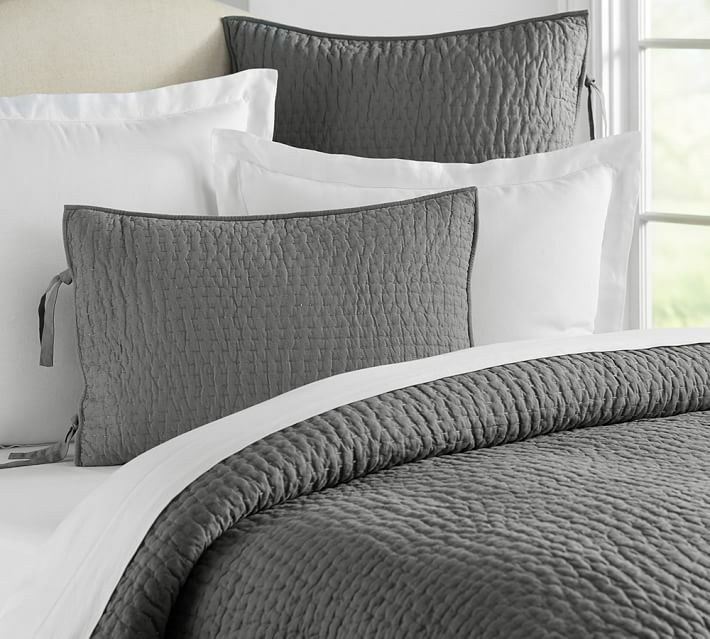 I love our pick stitch quilts, and purchased the gray textured pillows back in the spring and love them. I love that I can pair them with another patterned pillow and pretty much use them year round. I eat a red popscicle to cool off and then I get to work! I'm with you, Kim, I love the cooler weather and I'm anxiously waiting for Fall. I have a PB gift card burning a hole in my wallet. I was waiting for their new Fall line to come out. Hate to say this but I am enjoying 70 degree weather and cool breezes! I know whatever you pick will be beautiful. I am a summer girl but with not being in the new house yet and summer whizing by I think I will enjoy the fall in the new house and will be more creative with decorating for fall this year. Have a great weekend. wow summer is so short and you are already thinking of fall!!! I love summer heat and all...no humidity thank you!!! Jeanie, bloggers have to think and plan ahead kind of like the stores to bring y'all ideas and inspiration. As far as humidity we have some of the thickest here at 90% right now. That's what I hate about summer. If I lived where it was low humidity and I could enjoy the great outdoors I would love it. I always love to see how you "dress" your beds! I've been searching for some new dust ruffles...wanting something other than solids. Any recommendations on where to look? Love your selections! Im with you...I do not enjoy heat and humidity. Cant wzit to see how you style your beds! Love the new vintage look PB pillow. May have to get that one. The color is beautiful and they are on sale right now...even better!